This is a very large antique Victorian enameled sterling silver sash pin with tiny gold enameled fleur de lis around the borders and in the corners along with tiny gold stars. It also has a light gold wash on the back. Size is 3 1/8" long East to West by 2" tall North to South. It is beautifully made by hand and the tiny worn enamel spots you see in the photo are NOT as noticeable in person at all. The sterling is thick and substantial. Weight is HEAVY at 46.1 grams. An absolutely gorgeous Victorian sash pin for your collection. 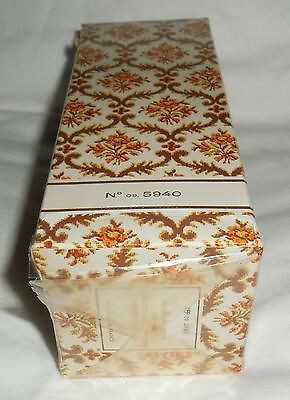 This is a vintage Marcel Rochas Eau de Cologne atomizer refill still in its original sealed box. Never opened. Never used. The box is large at 6" tall. Excellent condition. The bottom cellophane covering is starting to open from age but the box is still sealed and has not been touched. Nice item for anyone who collects these vintage fragrances. 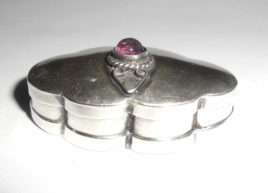 Mid Century Mexican Sterling Silver Amethyst Pillbox Ladies Box - Lovely jeweled sterling silver ladies accessory, late mid century, hinged box with its original hand cut amethyst stone cabochon. The bottom is marked Sterling, 925, Mexico. The amethyst has much better purple color than the photo could capture. It is all handmade and has a wave cut scalloped front with pop down lid that holds tight from the sides but never had a lock. After all these years it has still held its form quite well. and open and closes easily. It was never monogrammed or inscribed. Overall condition is excellent. No dents or dings to the sterling silver silver. No chips or cracks to the bezel set 5mm amethyst stone. The stone has a medium purple color with a nice internal glow. The bezel setting is finished off with a twisted silver application around the perimeter of the bezel. Size from top of cabochon to bottom of box is 5/8" tall. Left to right east to west measures 1 1/2" long. Width/depth measures 7/8" front to back. Not easy to find original, older mid century jeweled Mexican Sterling Silver items this is a lovely box for your collection. This is a rare estate find for your Art Deco sterling silver collection featuring the Art Deco Metrolopolitan Life Building in NYC. 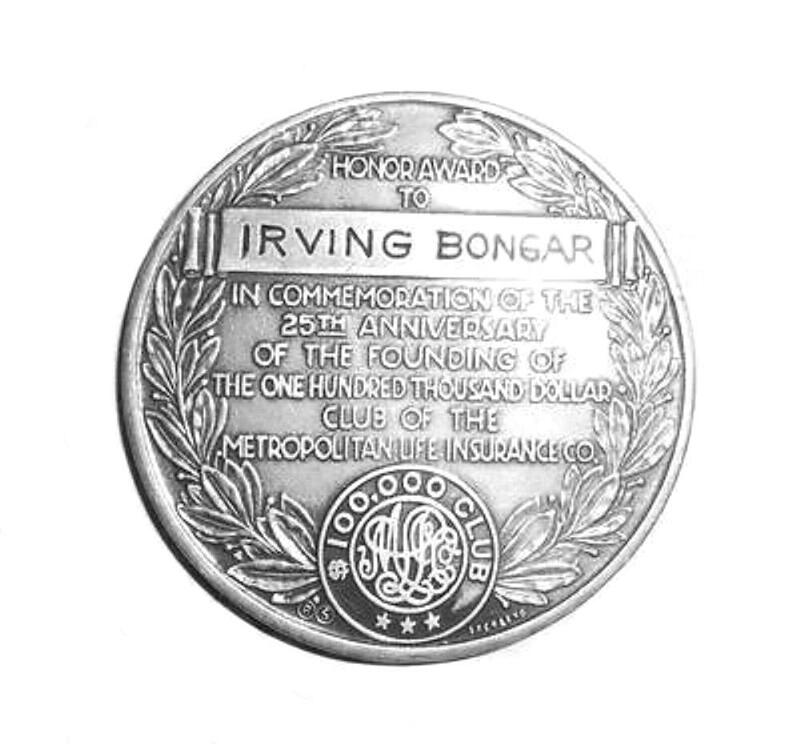 It is a 1935 sterling silver commemorative award coin which was presented to one Irving Bongar in 1935 for the 25th anniversary of the $100,000 club. Size is 1 3/4″ across. Weight is 30.4 grams. Condition is excellent. All still nicely raised, deeply recessed, crisp, and clear (better than photos show). It is also beautifully made with very fine detail. This is a lovely, hard to find estate item for any Art Deco or architectural enthusiast OR just add a bezel for a fob or Art Deco pendant necklace. It is an excellent depiction of the large Art Deco Met Life Building in NYC. Sterling Silver Desk Accessory Rolling Seal Stamp Envelope Roller - Marked Sterling this is a vintage Art Deco to Early Mid Century mens or womens desk/writing accessories roller for sealing stamps, envelopes etc....It is also able to be used as a lint remover roller as the paper roller pops in and out and is easily removable and changeable. You would have to have the right size rolling brush. Size of this roller is 4 1/2" tall from top of handle to bottom of roller. Width across the roller east to west is 2 5/8" across. 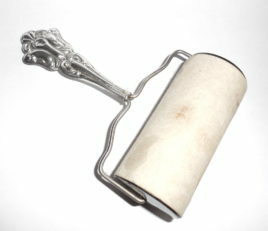 It is part of a group of vintage and antique estate silver pieces and is in original condition. It was never monogrammed or inscribed. One side of the handle has 2 age dings. Other than this, it is excellent. No tears or seam splits. No repair or alterations. This is a lovely older vintage tool whether used as a sealer desk accessory on your desk or as a lint remover on your vanity. The roller itself is in excellent condition and rolls easily. The hollow handles top has a very pretty repoussed design. The connector is still very strong. 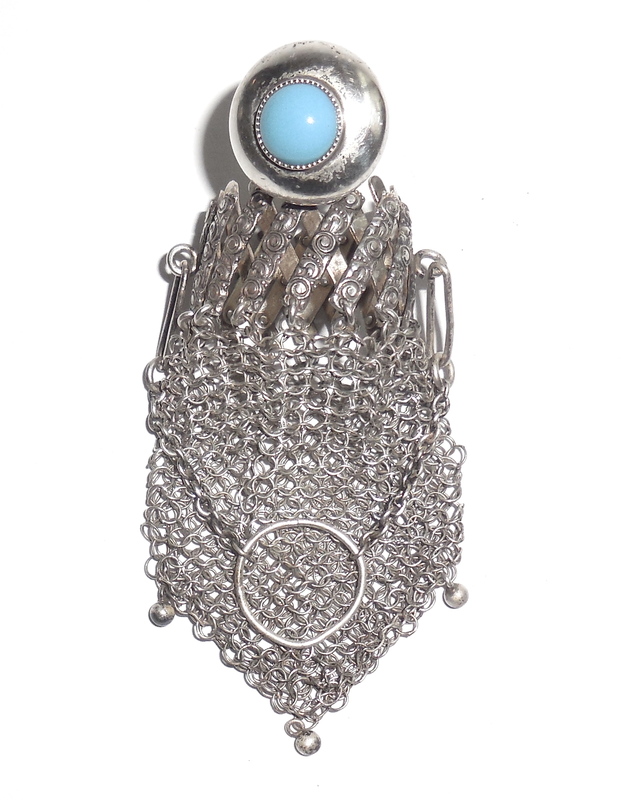 This is a gorgeous early Art Deco sterling silver chatelaine purse, coin bag, small handbag or finger bag with a jeweled turquoise and ornate repoussed expansion top. The entire bag is Guaranteed to be solid sterling silver. No plated parts. All consistently sterling silver throughout. Completely original estate item. As is common with these early jeweled bags the gemstone is either glass or a reconstituted mix containing glass. The inside of the top is marked Sterling, old block letters full word mark. 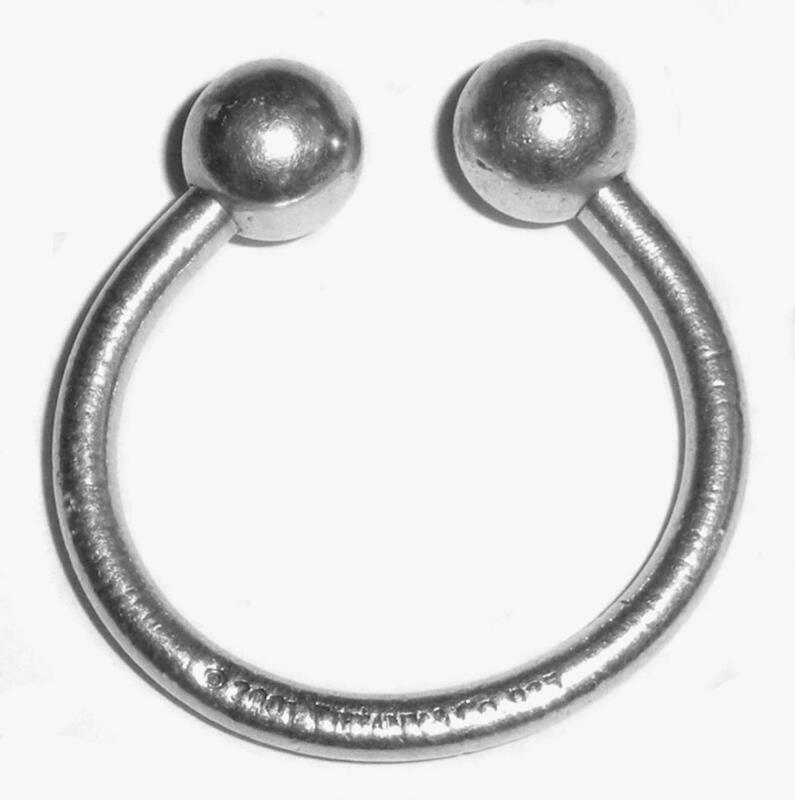 The bottom is finished with 3 small sterling beads. From age and use it needs 3 links which are easily accessible and easy to apply. Other than this it is in excellent overall condition. All original. All rivets in the expansion are strong and intact. No looseness or wobble. The stone is also excellent. No cracks or chips. Size of purse without the chain is 4" north to south from top of stone to bottom center bead. Width across east to west is about 2" when open. With the chain the size is 5" from top of finger/chatelaine circle to bottom center bead. These are very hard to find with good repousse expansions and jeweled tops in solid sterling silver. This is a beautiful early bag for your collection or to add to your special chatelaine top. 925 Sterling Silver Tiffany & Company large sized key ring holder with screw ball end for easy access to key removal and insertion. Many of these marked Tiffany & Co and made of solid sterling but are not authentic. This one looks good but unknown if actually authentic. Marked, tested and Guaranteed solid sterling silver. Size is 1 5/8" North to South by 1 9/16" wide across. Sterling thickness is 1/8". Very strong and well made. Weight is heavy at 23.7 grams. The screw turns easily and stays in place. Has some nicks and dings from prior use. 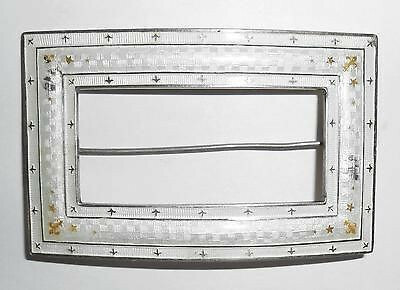 Beautifully made, this is a very large fancy antique Victorian to early Art Nouveau sterling silver belt or sash buckle. It is marked and guaranteed to be solid sterling silver....not plated. Size is 3" long by 2.5" wide. The sterling silver is very thick, solid and strong. Weight is heavy at 43 grams. Other than some light surface age wear it is in Excellent Original condition. No dents. No tears. No repair. All original. The buckle mechanism is strong and moves easily. 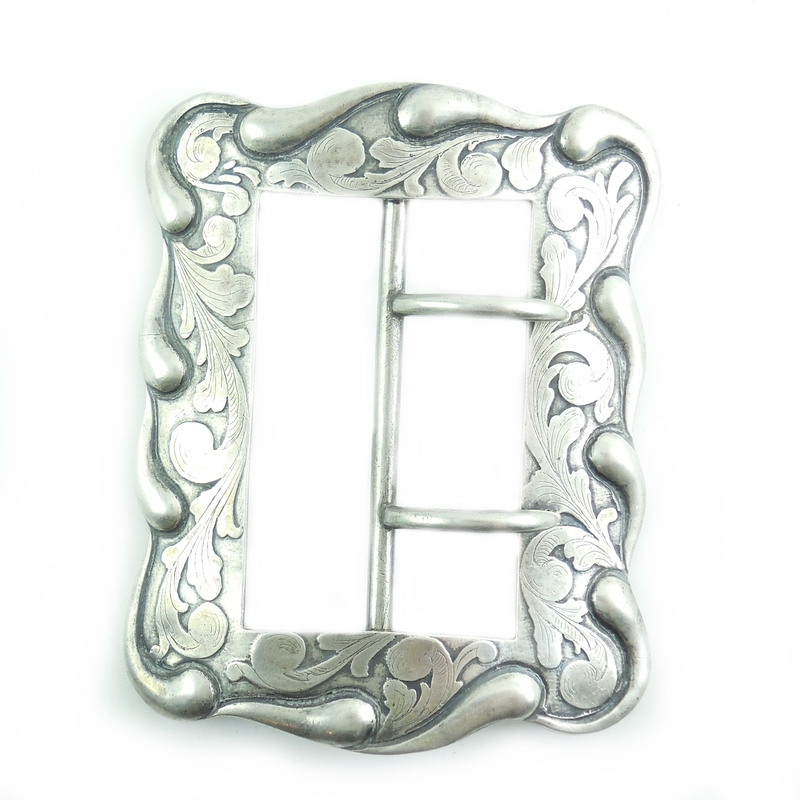 This is a gorgeous showy buckle for your antique clothing and accessories collection. 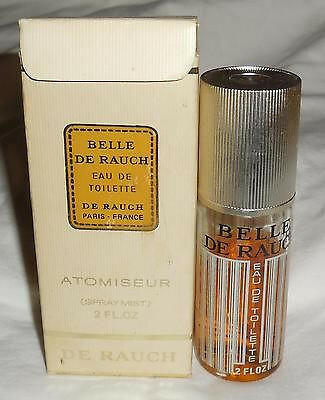 This is a bottle of vintage De Rauch, Belle De Rauch Eau de Toilette spray atomizer refill in its original box. Excellent condition. The bottle is still 60% to 65% full. Size is 2 ozs bottle. Nice unusual and harder to find item for anyone who collects vintage fragrances. Excellent Condition. No worn enamel. No repair. Sorry for the photo glare. 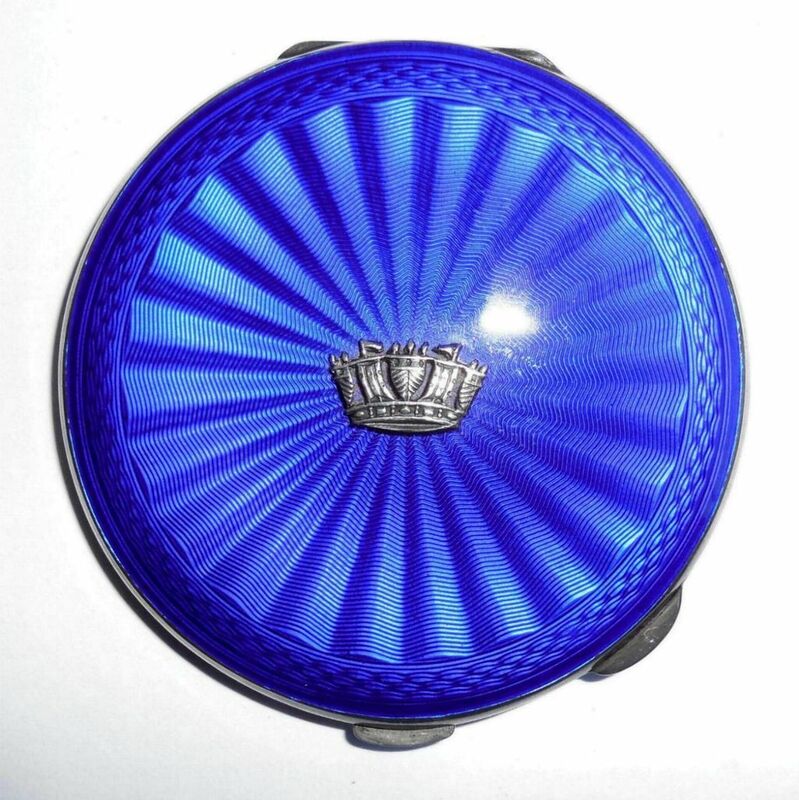 This is a stunning cobalt blue enameled ladies compact with 1955 Birmingham English Sterling Silver hallmarks and the British royal crown on top. Size is 3" across. Weight is 121.5 grams. From an estate. The inside has its original mirror finish and looks like it was rarely used. Other than a few light surface scratches on the inside it is in wonderful condition. All of the cobalt blue enamel work is intact. It was never monogrammed or inscribed. The back has a fancy weave pattern in the sterling that is still crisp. There are no dents or dings. 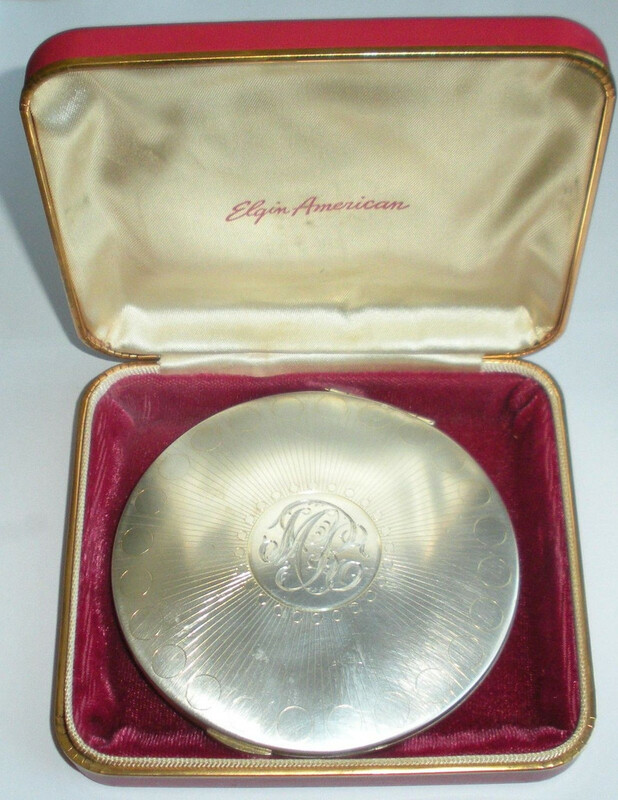 This is a gorgeous vintage statement compact for your English Silver collection. 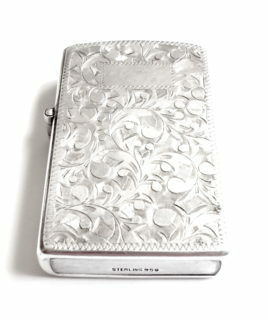 Vintage Fancy High Grade 950 Sterling Silver Etched Lighter Mens Womens - This is a very ornate mid century, fancy etched, high quality, 950 sterling silver (higher grade than 925 sterling) pocket lighter for cigarettes or cigars. It is marked sterling, (old block letter marking) 950 and is guaranteed to be solid 950 silver. Other than some light surface scuffs on the cartouche (which can be jeweler polished out) the sterling case is in excellent overall condition. Never monogrammed or inscribed. Never altered, modified, repaired etc....Completely original and excellent. The lighter inside the case is the original but is not working. However, it slides in and out so it can be removed or replaced or add fluid to this one. This is the original lighter. The wheel spins around but doesn't seem to catch. The wick is intact. Size is 2 1/4" tall by 1 3/8" wide across by 7/16" deep. 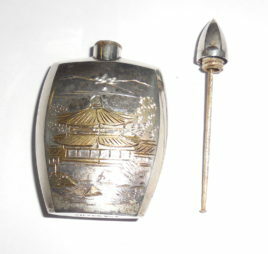 This is a gorgeous high grade vintage sterling silver lighter for your collection. Good for formal evening or daytime use. 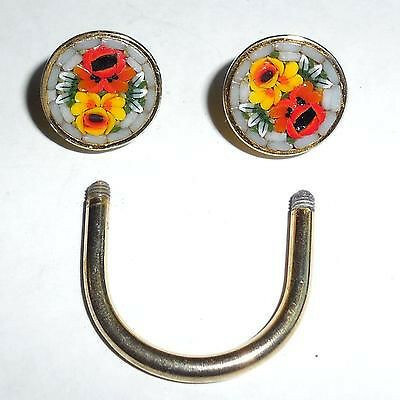 This is a lovely pair vintage hand made Italian micromosaic and gold plated screw style key ring. Each micromosaic end screws off the ring for easy access to change, remove or add keys. Size is 1 5/8" across from the end of one mosaic half sphere to the end of the other. Height from the top of the micromosaic to the bottom of the U shaped ring is 1 1/4". The micromosaic sections are 5/8" across each. 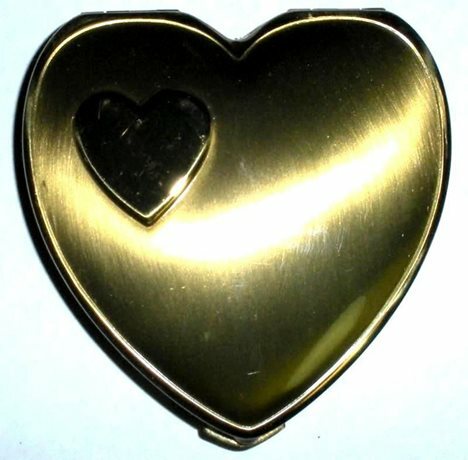 This is a lovely estate item for your vintage and antique ladies accessories collection. It is all original and the tops have bright colorful mosaic tile work. 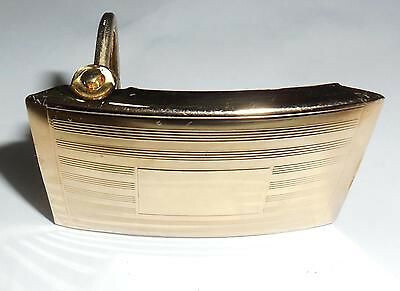 Vintage Japanese 950 Sterling Silver Gold Perfume Bottle Scenic - This is a gorgeous vintage Art Deco to mid century fancy Japanese 950 Sterling Silver with Gold perfume bottle for personal handbag use of vanity. It is marked 950 silver. The Japanese government originally introduced the 950 silver standard mark for sterling silver in the 1920s. This is more pure than the US sterling silver standard of 925. The front of the bottle is very ornately hand etched with a scenic front composed of pagoda, mountains, lake, foliage, birds etc....Beautifully made with strong attention to detail. It is very thick, solid, strong and durable; very well made. Size is 2 1/8" by 1 3/16". Overall condition is excellent. All gold is intact, not worn down so the gold sections must very heavily applied. No dents or dings or damage or repair. Completely original with silver dabber still intact. The back was never monogrammed or inscribed. There is general age wear which could be polished out for brightness. No tears or deep scratches. This is a stunning older vintage estate perfume bottle in high grade silver with strong hand crafting for your vintage and antique ladies accessories or perfume bottle collection. 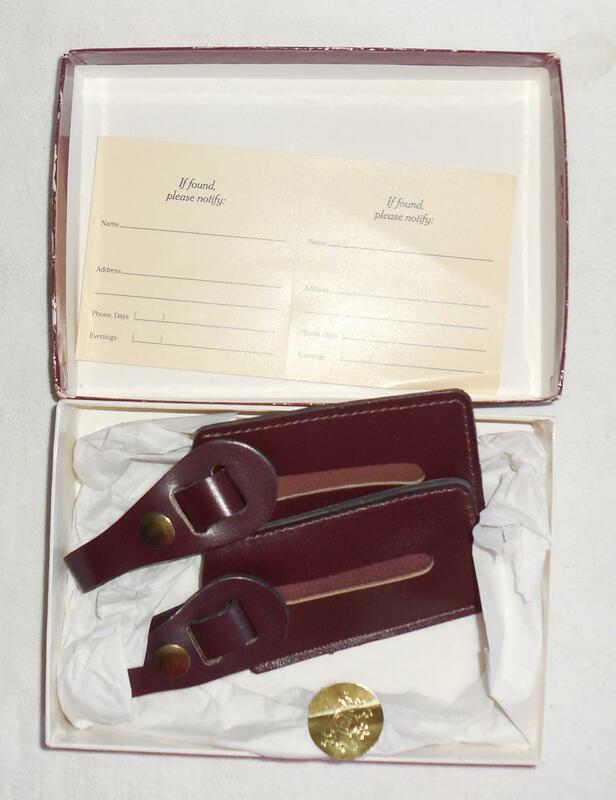 Vintage Philip Morris Luggage Tags in Box Never Used Estate Item Material: Leather Size: 6.25 inches by 2.25 inches Condition: Good as new tags. Box has age wear on edges. Please click to see full photos and read production. Please use the contact us link at the top of this page if you have any questions. 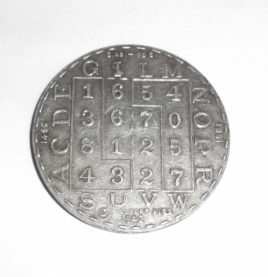 Vintage Pure 1000 Sterling Silver Albert Wiss Mathematical Historic Coin Medal Tool - Marked 1000 Fine Pure this is a vintage Art Deco coin medal tool invented by Albert Wiss which uses mathematical formula, calculations in order to determine dates and events of historical significance. These were made in silver and gold and given out to specific members of the American Mathematics Society of New York. Very little information is available with regard to Albert Wiss but it is known that there are not many of this particular coin medal and few examples rarely come up for auction. Size is 1 9/16" across in diameter. Weight is 41.6 grams. Thickness is 1/8". Condition is excellent. Still crisp and clear. Not worn down. No dents or dings. No tears or deep scratches. Some normal surface age wear only. It has been left in the original condition in which it came from the estate and has light age patina which has not been polished off. If you look carefully you will see that the outer dates represent Christopher Columbus discovery of America in 1492, World War 2 in 1942, Abraham Lincoln becomes president and start of Civil War in 1961, Independence from Britain in 1776 and the corresponding July 4 birthday of US independence. Along with this there is are many letters and numbers but one would need to know how to use it. This is a lovely, most unusual and hard to find coin medal for your collection particularly if you are well versed in mathematics.